Drug-Free World D.C. Metro Chapter | Effective drug education that reduces drug use. D.C. Metro Area Chapter Website! The Foundation for a Drug-Free World is a nonprofit public benefit corporation that empowers youth and adults with factual information about drugs so they can make informed decisions and live drug-free lives. 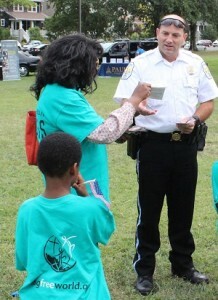 Drug -Free World D.C. volunteer showing Truth About Drugs booklet to D.C. Police office during National Night Out event. Drug-Free World D.C. is bringing the The Truth About Drugs education and prevention program to the people of the Washington, D.C. metropolitan area. CLICK HERE to order The Truth About Drugs education materials for your use (they’re free). If you would like further information about the Drug -Free World D.C. Chapter click here to contact us.